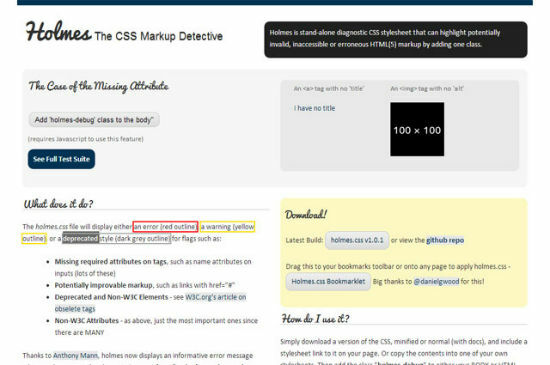 To make use of Holmes, we need to embed the stylesheet into the head of the HTML to be checked. Then we attach the class holmes-debug to the BODY. At render-time Holmes colors all HTML elements red, where it diagnosed a flaw, be it missing attributes such as the ALT attribute for images or real errors. On finding elements for which better markups exist, e.g. for # as link in A, Holmes issues a warning, highlighting the element in yellow. Furthermore, Holmes colors any deprecated element, such as CENTER or FONT gray. As Holmes does rely on partially new CSS features, such as the pseudo class :not(), it does not work with every browser. We have tested it successfully in Chrome, Firefox, Opera and Safari and – tadaaa – Internet Explorer 10.